I have wonderful friends. Ones who support me and understand me. So, when they heard I was injured and stuck lying around; off my leg for weeks to come, two of the most insightful ones brought me a gift of art. 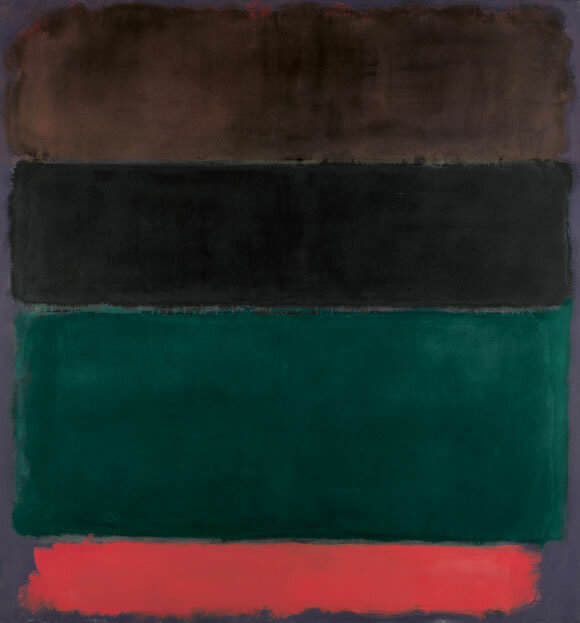 Both went to museums and came back to me with Rothkos. One with a beautiful print and, one with a powerfully written tale of his trip to see a Rothko in my honor. They understand me well. Some works of art have the ability to transport us emotionally to another plane of experience. Certainly music will do this for most of us. Think of the elevating power of the final movement of Beethoven’s 9th symphony, the Ode to Joy or listen to Pachelbel’s canon. Visual arts too have this power. The Shiva Linga paintings that I discussed in an earlier post are a clear and direct example of this. They were painted as devotional images intended for use during meditation to help the believer focus their prayers. The paintings depict one of the forms of the Hindu god Shiva, the god of destruction and transformation. He oversees death and rebirth. These paintings therefore are meant to represent transitional space between creation and dissolution. Despite my not being Hindu or particularly meditative, I found these paintings absolutely compelling. They are simple and repetitive; painted on found scraps of paper by individual, anonymous practitioners. Similar yet interesting in their differences. As I stared into their central black ovals I felt the world around melting away from behind me while the black space grew to envelope my thoughts.